I came to this world from my mother love . I'm human, just like you. A little bit different from you or little bit more like you, but nothing much. Don't tell me or don't look at me like I don't belong here. Today I'm not gone be that little cute girl in ruffled dress, I 'm just gone keep my smile, myself and cover up under my fedora. Oh, no I will not hide. You will definitely notice me from far. I cherish my mothers love and spread it with my look and smile. P.S. I have to apologize about not commenting on your posts my darlings. There is some kind a technical problem with Blogger again. I have problems with logging and leaving comments. Blogger is working on this issue, but there is already three days. Gosh, how frustrating this is. Fingers cross that soon I could make comments on your blogs. You should be proud of who you are - you are beautiful, with your own unique character and talents. Is that leggings you are wearing? It looks great. I like what you wrote, and you look lovely! your such cutie love that pink bandana !!! so cute Ramone! I love your shirt ... really cool! Oh, love the pink details here! I love this post ramona! It'so lovely and so it is your outfit! Bonjour!!! Tres jolie ce look!!! You are beautiful. I adore those leggings on you, and such a gorgeous dress! I love this look! It suits you just as much as the cute dresses you wear! I love that necklace and that top! and FOR SURE amazing necklace you made!!!!! i like so much your maxi shirt and your shoes!! good job babe! you look great. love the outfit! i just came across your blog and i think its great. i hope you will come visit my blog and maybe we can follow each other. Nice outfit! I love the white maxi blouse, super cute. love the way u wear that shirt! lovely! Hey pretty girl! Thanks for stopping by my blog! Ramona I had the same problem with blogger, I changed browser and now it works! Love the look.. Reminds me of something Kate Moss would wear.. What color are those leggings?? WERK! love the colours in these pictures! hey girl! thanks you very much for the comment! i'm going to follow you, can you follow me :)? very nice! I love what you wrote. I feel like that sometimes. oh wow, oh wow, oh woooow! I love everything; your blouse, your leggings, your shoes! love your shirt and chain!! love you top and fedora! wow i love this look! that harness is amazing! my favorite part of your outfit is your bracelet! I adore your bright pink accessories - they are fab and really pop! hey ramona, there will be better days, i think! ;) we have 18` and many clouds in germany. not better!!! the photos are some inspirations for my trip to egypt in june. the necklace made by u is amazing!! i love this one from al your outfits. I love the liquid leggings! Great look! gorgeous outfit! I love pink stone&chain harness, I can't believe that it's actually handmade ! 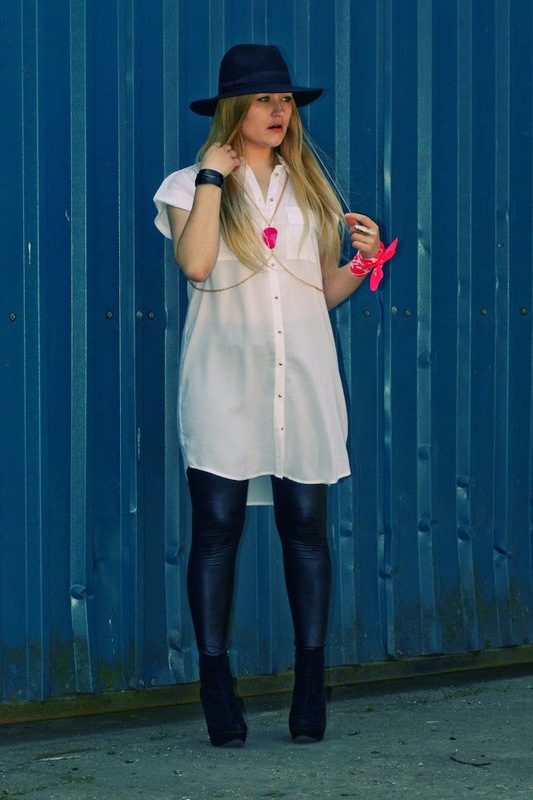 i love the pops of pink against the black and white outfit - it's such a cool look! I am love with the hat. YOu can pull it off very well! you officially have a new follower! Youre such a cutie and I like your style! Love your hat! Very cute! Cute outfit! Love the pink details! I wanted to comment before, but I couldn't because I have my own domain and there's not a name/url option on your blog. Now I have a wordpress adress too, so thank you for commenting on my blog, and sorry it took me so long to comment back on yours. I loved your style! I am in love with yer top! Gorgeous! The scarf tied at your wrist is such a creative touch. Also, I really like the title of your blog! !